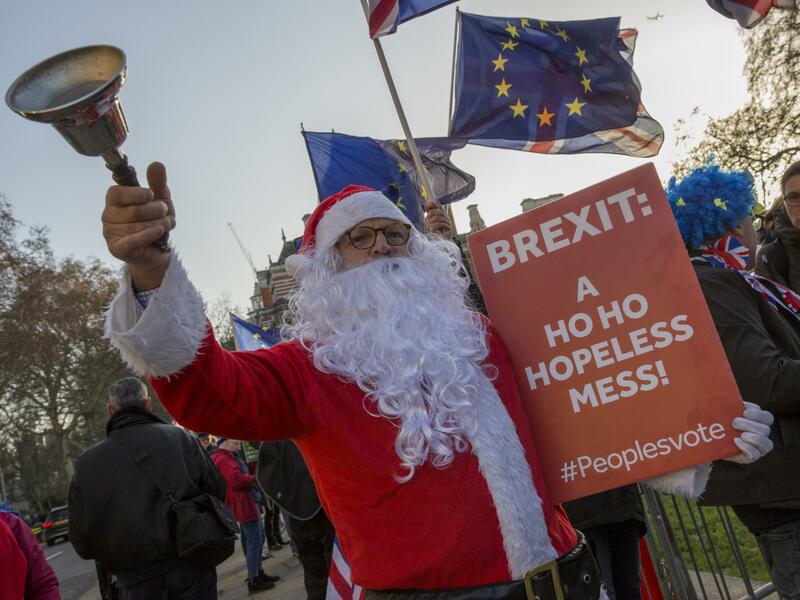 Anti-Brexit activists protest outside Parliament Dec. 11. Not so long ago, staging another Brexit referendum in the United Kingdom seemed almost unthinkable. But in recent weeks, as calls have grown louder, the unthinkable has begun to seem plausible. Last week, former Prime Minister Tony Blair said because of the current political chaos and future economic risks, the British should have another say on whether to leave the European Union if there are no other viable options. "Our knowledge of the consequence is a world greater than when we took the decision," said Blair, referring to the 2016 Brexit referendum. "In what other circumstances would we refuse the right to reconsider ... indeed regard discussion of such a change as somehow a betrayal of principle?" On Monday, Prime Minister Theresa May said taking the issue back to voters would indeed constitute a betrayal. "Another vote ... would do irreparable damage to the integrity of our politics," said May, "because it would say to millions who trusted in democracy, that our democracy does not deliver." How did the call for a second referendum go from a complete long shot to a possibility politicians are now discussing? Analysts say it is a function of dwindling options and the risk of parliamentary gridlock. The prime minister's Brexit "divorce" deal is so unpopular she canceled last week's parliamentary vote and now is aiming to bring it up the week of Jan. 14, in hopes that legislators will have had a change of heart over the holidays. If May's deal fails, the default option is to leave the European Union with no deal at all, which is certain to cause disruption and economic damage to the United Kingdom. At that point, a second referendum may be the least bad option, says Bronwen Maddox, director of the Institute for Government, a nonpartisan think tank in London. Members of Parliament "are toying with this idea of should we put it back to a people's vote," said Maddox, "to say to people: 'Look, now that you've got a better idea of what Brexit really looks like, what do you think? Tell us what to do. Because we can't reach an agreement ourselves.' "
Maddox says the likelihood of a second vote is rising. So does the Eurasia Group, a political risk consultancy, which put the probability at 40 percent on Monday. A Sky Data poll from Monday shows 53 percent of respondents would support holding a referendum on whether to back the prime minister's deal, no deal or remaining in the European Union, while 36 percent would oppose it. The same poll also found that 51 percent agreed with the prime minister that a second vote would break faith with the British people, while 42 percent said it wouldn't. The results, which could be seen as contradictory, speak to how unhappy people are about the Brexit options, and how uneasy the prospect of another vote makes them. If there were another poll — and that is a big if — Maddox says a narrow margin for remaining in the European Union would do nothing to heal the already-bitter divisions in the United Kingdom. "You could see a lot of acrimony," said Maddox. "I think [it would be] very, very hard for the country to put all this to rest." The idea of a second referendum frustrates some who voted to leave the first time around. "What's the point of a second referendum?" asks Sue Connelly, who serves as secretary for Andrew Rosindell, the Conservative member of Parliament for Romford in East London. "You had the first one and they can't deliver on that." On her desk are two pictures of the late Conservative Prime Minister Margaret Thatcher, and there's a poster with the message "Keep Calm and Leave the EU." Connelly thinks the talk of a second vote has even angered some Remainers, who she says see it as undermining democracy. If Britain were to hold another referendum, she predicts, even more people would vote to leave the European Union than in 2016.